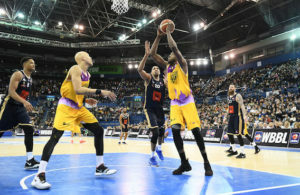 Sheffield Sharks took a giant step towards an encounter with Mersey in next month’s BBL Cup Final by destroying Cheshire Jets 107-85 in the first leg of their semi-final at the Northgate Arena. The first quarter saw both sides trading baskets before back-to-back three pointers from Steve Dagostino and Ryan Patton for the visitors helped them take the score out to 17-26 and despite the Jets bagging the final four points of the period the Sharks headed into the second quarter leading 21-26. In the second period both teams continued to trade baskets, but the Sharks kept their noses in front throughout the quarter with some more impressive outside shooting from Patton took the score out to 51-37 midway through the period. The visitors held off a resilient finish to the period from the home side to head into the locker rooms leading 45-57 at the half. In the second half the Jets started the third quarter with a 12-2 burst to get right back into the game and trim the deficit to 59-57, but the Sharks, thanks in no small part to Patton, began to find their range from beyond the three-point arc as he bagged five three’s in the third period to help the Sharks out to a 69-84 lead heading into the final stanza. In the final quarter the Sharks continued to extend their lead and another three-pointer, this time from Olu Babalola, gave the Sharks their biggest lead of the game at 80-107 with less than a minute remaining. The home side bagged the final five points of the game, but it was the Sharks who head into the second leg on Friday evening at the EIS with a significant advantage. Patton bagged a game-high 28 points for the visitors, including 8/14 shooting from three-point range, while Jeremy Bell led the scoring for the Jets with 26 points.